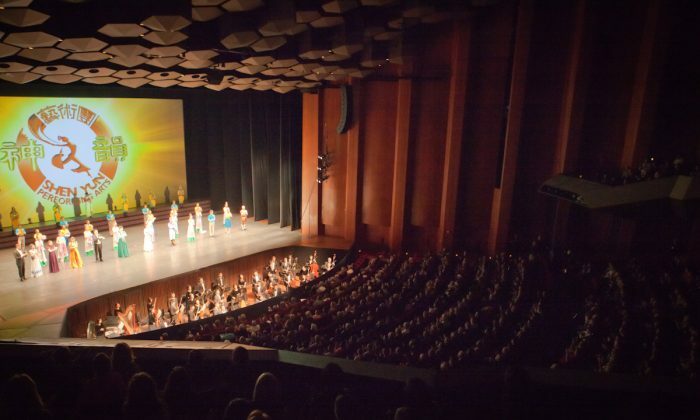 HOUSTON—From the very first moment the curtain opened, the stories told by Shen Yun Performing Arts intrigued Bruce and Joanie Bain. They were very impressed by the beauty of the performance. “In the opening scene I liked when they opened the curtains and the fog came cascading down on the orchestra,” said Mr. Bain, a trial attorney who has practiced in both state and federal courts. “I thought it was very uplifting,” he said. The Bains jointly run their own firm, Bain & Bain PLLC, specializing in complex litigation, appeals, and mediation. It’s very cultural and the costumes are beautiful, and very colorful, and elegant and very graceful. Mrs. Bain said Shen Yun’s whole performance was very well done and she wanted to see more. Mr. Bain also appreciated the pace of the action and the interactions between performers. Shen Yun is a classical Chinese dance company based in New York. One of the characteristics of classical Chinese dance is highly realistic emotional expression in both the face and body of the dancer. In classical Chinese dance, meaning and emotion are what drive movement and performers receive specific training on how to express their inner feelings. The mission of Shen Yun is to revive traditional Chinese culture through the performing arts. Performances include mini-drama pieces that tell stories from ancient legends and classic literature. Both Mr. and Mrs. Bain liked the piece, The Fable of the Magic Brush, where a paintbrush brings objects to life. “I liked the fact that the magic brush could only be used by a pure heart. That was very good,” said Mrs. Bain. “I think the magic from the [Shen Yun] show just comes from the magic brush,” said Mr. Bain. He also liked the hopeful message that traditional culture will again be able to be expressed freely in mainland China, where currently the atheist Chinese Communist Party censors spiritual ideas. “And I like the non-subliminal image of [a] free China,” he said.